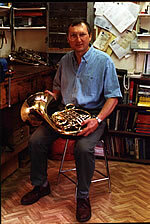 Roger Price is a professional member of the National Association of Musical Instrument Repairers and has now been repairing brass and woodwind instruments since 1986. During this time he has repaired more than 5,000 instruments, which have come from all over the United Kingdom (and a few beyond). The complexity of these repairs has varied between routine servicing to major restoration work, where most people might have considered the instrument beyond repair. To accomplish this work he has developed comprehensive workshop facilities with a wide range of specialist tools. Many of these are of his own design, making use of his earlier background of 22 years as a metallurgist in the engineering industries. 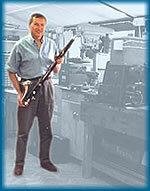 The types of instruments that Roger repairs are bassoons, clarinets, cornets, euphoniums, flutes, French horns, oboes, piccolos, saxophones, tenor horns, trombones, trumpets, and tubas. All work carried out in our own well-equipped workshop. All work carried out by a trained and experienced craftsman. All work carried out within agreed costs and timescale. Same day service by appointment. Traditional repair skills combined with the latest technical know-how to give very good repairs. Modifications carried out to meet any special requirements. The majority of Roger's work comes by personal recommendation. He takes real pride in his work, but as an efficient craftsman in a very well equipped workshop his charges are surprisingly affordable. Brass: Servicing, dent removal, resoldering, brazing, making and fitting patches/guards, valve work, trombone slide dents and re-alingments, special modifications etc. These are all overhauled before sale (except for a few special collectors instruments which are identified as such) to put them in good playing condition. They are all supplied with cases, mouthpieces and slings where appropriate unless specified otherwise..
For woodwind instruments this means that all pads, corks and springs are in good condition and the keywork is in good condition and correctly regulated, tenons are a good fit and the instrument is generally in good playing condition. The 'cosmetic appearance' of the instrument is usually described and reflected in the price. For brass instruments it means that valves and slides are working correctly, there are no leaks or broken joints and none of the dents in the instrument are judged likely to affect the correct playing of the instrument and again the instrument is generally in good playing condition. The 'cosmetic appearance' of the instrument is described (i.e. any lacquer or plating wear and any residual dents judged impractical or uneconomic to remove) and again is reflected in the price.